Are You a Candidate for Porcelain Veneers? How Much Do Porcelain Veneers Cost? How Much do Smile Makeovers Cost? How Durable are Smile Makeovers? Home > Services > Cosmetic Dentistry Services for a Beautiful New Smile > Repair Your Smile with Porcelain Veneers > How Much Do Porcelain Veneers Cost? Investing in cosmetic dentistry is a big decision. But making the choice to get porcelain veneers in particular is well worth the results. A long-lasting solution for a wide variety of aesthetic smile complaints, veneers have the ability to improve your smile and your overall appearance. You can look younger, happier, healthier, and even wealthier when you smile a natural-looking smile created with porcelain veneers. Financing options make this dream smile an affordable reality. Porcelain veneers are on the higher end of cosmetic dentistry treatments when it comes to cost. While our Manhattan dentistry practice accepts most major dental PPO insurances, in many cases dental insurance does not provide coverage for aesthetic procedures. You may or may not have savings or expendable income to put into veneer treatment, but you don’t have to have the cash in hand in order to get the smile you want right now. Care Credit in particular is a popular choice to finance cosmetic dentistry treatments. There is 0 percent interest financing available for up to 18 months. The fixed annual interest rate for Care Credit is as low as 3.9 percent and, for example, payments can be as low as $125 per month for a $5,000 treatment fee. There are no fees to apply and no prepayment penalties for Care Credit. A wide range of financing plans are available depending on your credit history. Also, we have another affordable financing through Lending Club Financing which offer 0% Interest Financing Available Up to 18 months for General and Cosmetic Procedures. Dr. Wei and the staff are happy to answer your questions about payment options and affordable financing. We look forward to meeting you. A dental treatment that can last for over 15 years is well worth the investment in its price. If you take care of your veneers with regular visits to the dentist and proper brushing and flossing every day, they can last for decades, making every penny of the price of the treatment worth it. A new smile can transform your life completely. A gorgeous smile can open doors professionally, socially, and romantically. You will feel more confident about yourself and less self-conscious about the stained, chipped, broken, or gapped smile you used to sport. The benefits of porcelain veneers are priceless. Attempting to quantify the multiple amazing side effects of porcelain veneers by comparing the results to the price of the procedure is fruitless – veneers revolutionize peoples’ lives. Veneers are durable, which means you never have to worry about the integrity of your teeth while eating a meal or speaking. Veneers are resistant to stains – they are essentially a permanent teeth-whitening solution that won’t fall victim to your coffee addiction. Veneers are versatile, correcting multiple smile imperfections at once, limiting the amount of time you need to sit in a dentist’s chair, and reducing the cost of your cosmetic dentistry bill. Above all, porcelain veneers look completely natural. You don’t want to invest thousands of dollars in a cosmetic dentistry treatment if you don’t have a guarantee that you’ll look like the best version of yourself when all is said and done. With veneers, you will look your very best. And others will notice too, in a good way. Contact Dr. Michael J. Wei in Manhattan to discuss your possibilities for porcelain veneers or Lumineers. Find out how many veneers you might need and figure out what financing options will work best for your budget. Because you already know your smile is worth the effort. 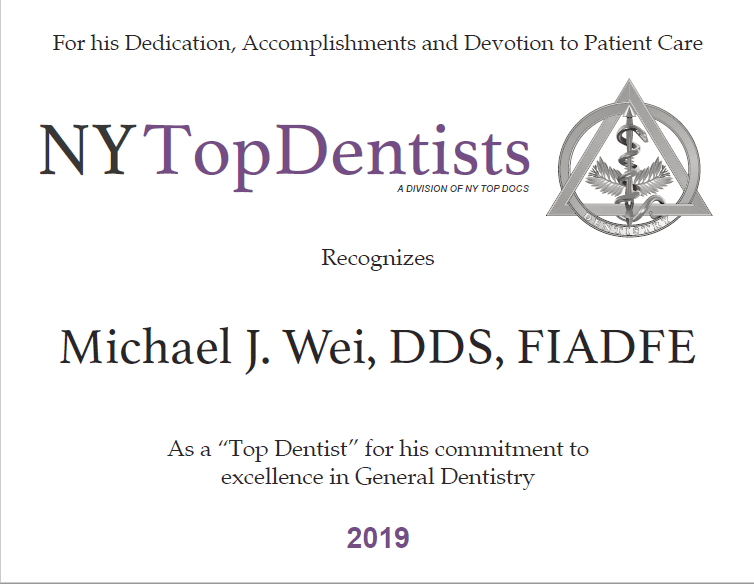 Dr. Michael Wei had the honor of being voted one of New York's Top Dentists in 2019 by USA Top Docs. The award is given only to dental professionals that have undergone a rigorous review process. 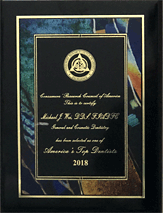 Dr. Michael Wei had the distinct honor of being voted one of America's Top Dentists in 2018 by the Consumer's Research Council of America. Dr. Wei has won this award every year since 2005.